Your next ideal vacation destination has to be an island. By definition, geographically separate and in delicious isolation, an island offers the perfect escape. Get away from the pressures of everyday life and take off for an island bolt-hole. Fortunately, there are many to choose from and there is something to please everyone. Here are some suggestions for upgrading your next vacation to an island paradise location. If time and budget is tight, why not try an island idyll that’s close to home? Without stepping foot out of the USA, vacationers can take a ferry to Mackinac Island in the Straits of Mackinac. Located in the waters between Lake Michigan and Huron, this quaint historic island allows visitors to step off the roller-coaster of modern life, back to an era of gentility and civility. Attractive colonial and Victorian era architecture is scattered across this tiny paradise and Mackinac Island Hotels offer real variety with accommodation in romantic beach side inns, spacious family lodgings and elegant summer palaces. Value the peace and quiet of traffic-free Mackinac where cars are banned and the main mode of transport is bicycle or horse-drawn carriage. Hiking or cycling around the eight mile perimeter of the island is a popular way of appreciating the scenery. Fans of the outdoors keep busy with horse riding, sailing, fishing and golf. Visitors with a sweet tooth can sample some of Mackinac’s famous fudge that has been produced on the island since the 1800s. For a complete contrast, head for the paradise islands of The Maldives in the Indian Ocean. Primarily a place to relax and unwind with its luxury resorts built on sun-bathed coral atolls; activities such as scuba diving and surfing are popular in the warm, clear waters. This popular location is most famous for its charming over-water bungalows that rest on stilts above the turquoise lagoons. Such accommodations are popular with honeymooners and the jet set, as are the many luxury bungalows with private beaches that fringe the crystal clear waters. That said, there is a wide choice of resorts offering varied packages for different budgets. The Maldives are remotely located and are the perfect destination for disconnecting totally from the rest of the world for a while. Escapism isn’t all about relaxation: islands such as Corsica in France provide rugged mountain scenery and great hiking for the more active vacationer. You can explore the snow-capped peaks and picturesque rocky landscapes one day, then discover the sandy Mediterranean beaches the next. Although part of France, Corsica has its own distinctive culture and on a visit to this spectacular island vacationers will enjoy discovering ancient hillside villages – listen for the sheep bells ringing out across the landscape. Corsica is largely unspoilt and has resisted the modernization associated with mass tourism, making it the ideal destination for a central European island break. Island holidays may seem like a luxury, but with a little research and some detective work there are good deals to be found. Try shifting your perspective a little. 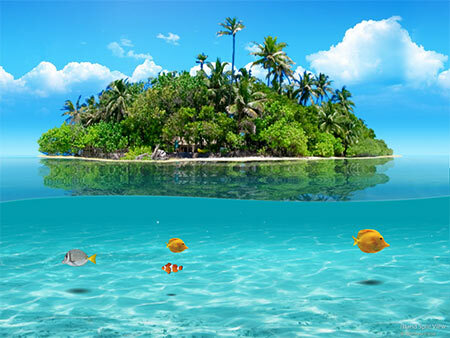 Remember, by definition islands are remote and isolated and need vacationers’ custom just as much as the vacationer longs for an idyllic break. It cuts both ways! Think positive and that upgrade to an island paradise will soon become reality.